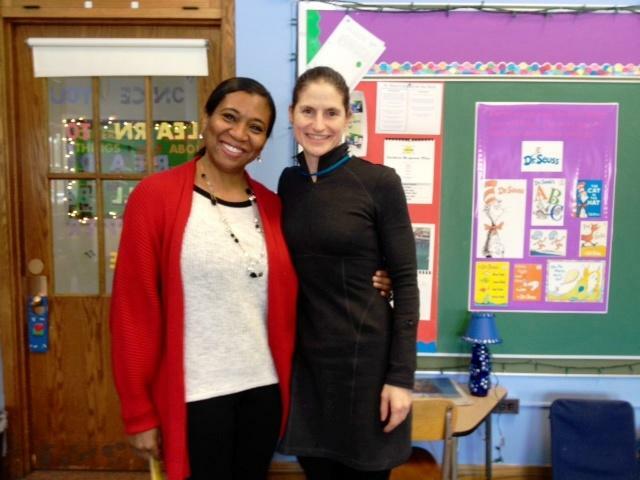 Kathy Wood (left) with teacher Anna Caci (right) inside a classroom at St. Mary's School for the Deaf in Buffalo. Inside the massive St. Mary's School for the Deaf building on Main Street, beautiful young children looked up at you and smile as they walked through the hallways. We traveled up a large staircase to visit with teacher Anna Caci, an elementary reading teacher at St. Mary's. Kathy Wood, associate dean of Buffalo State’s School of Education, wanted to share the story of her 28-year-old Jamaal. Wood was inspired by Caci's work. When Jamaal was 17-years of age Wood and her husband reached a crossroads facing years of struggling to find the right educational instruction. Jamaal is non-verbal and Wood had been on a long journey to find the right help to deal with his autism. "For a long time he was in a self-contained classroom in his elementary school years into his middle-school years and then in high school I wanted him to be in a more inclusive setting. And I did have him at a school district -- and it just didn't work out for him. And I really stumbled upon St. Mary's," said Wood. Inside Anna Caci's classroom at St. Mary's School for the Deaf. Woods knew about St. Mary's but didn't realize there was the capacity to assist with her son's special learning needs. "And I came -- and I just knew in my gut, I said this is where Jamaal should be," said Wood. "And St. Mary's did accept him into the program and I think he was with Anna Caci from Day one." Inside Anna Caci's reading classroom at St. Mary's School for the Deaf. The challenge for Caci -- how to communicate Jamaal -- described as high needs. He required great deal of one-on-one instruction. But Caci used her expertise in sign language with her deaf students to begin a teaching journey with Jamaal who could hear. "We taught him some basic functional signs -- like bathroom, wanting more, stop, help, please, but really we focused on a communication board if he wanted a certain thing -- like a certain snack or wanted to go to a certain room, or be by himself," said Caci. Caci has worked for many years with special needs students. Caci remarked that she was overwhelmed to learn 11-years later from Wood that she had been such a strong influence on Jamaal. Caci said it was Jamaal that made more of an impact on her life. "He enjoyed so much what he was doing and that reminded me hey life's not so bad. Enjoy each moment," said Caci. "He brought life to the classroom. He really did." Caci described Jamaal as a "spark". That teacher-student relationship brought tears to Wood's eyes as she reflected on her son's time at St. Mary's. "And my son can't speak for himself, so I would love to be able to speak on behalf of him to thank Anna. It was just such a great experience for him. It really, really was," said Wood. "It was hard for me to leave here. Because Jamaal is non-verbal and on the spectrum, he has more challenges in terms of academic challenges. In his prior experiences, the expectations weren't where I wanted them to be in terms of the teaches." But that all changed when Jamaal was taught by Caci. "I think what I appreciated was that Anna and the folks that worked with her highlighted what Jamaal could do well," said Wood. There is often a misconception in the community that St. Mary's is only for deaf students. But as in Jamaal's case it serves children with communications problems. The school works with students from birth to 21-years of age. "Our goal is to really get them prepared for the outside world," said Caci. "And it is a very, very loving environment here. I love my job here and I love my students." Caci remains humble about her success with Jamaal noted and credits teacher’s aides that helped work on her team in guiding Jamall. But for Wood, she emphasized the impact a teacher has on a child's life as well as an entire family. A teacher that was able to see the "positive" in Jamaal. 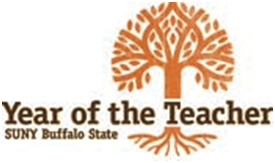 Buffalo State's Year of the Teacher logo. Buffalo State will continue to share stories through out its "Year of the Teacher"